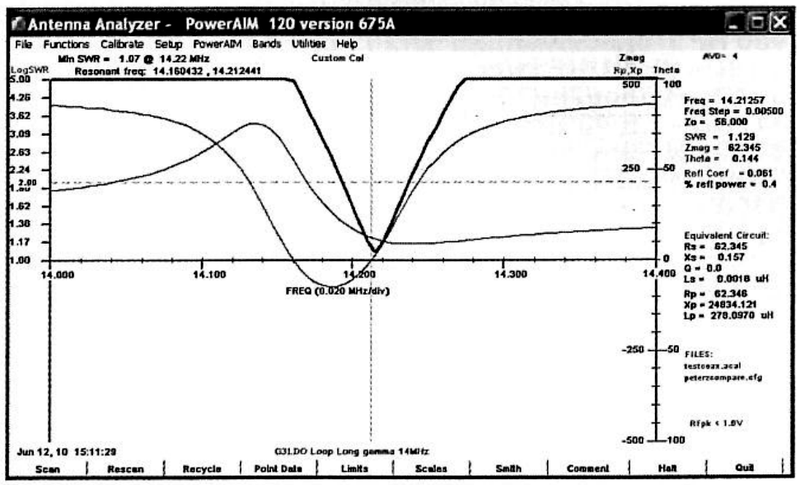 (Butler 1991) gives a design for a Small Transmitting Loop (STL) for 14MHz and some other bands. 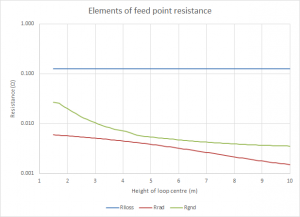 The meaning of the terms efficiency and radiation resistance are often critical to understanding written work on antennas, yet different authors use them differently, often without declaring their intended meaning. Mike Underhill (G3LHZ) is an enthusiastic proponent of Small Transmitting Loops and in his slide presentation (Underhill 2006) challenges the proposition that their efficiency is low. 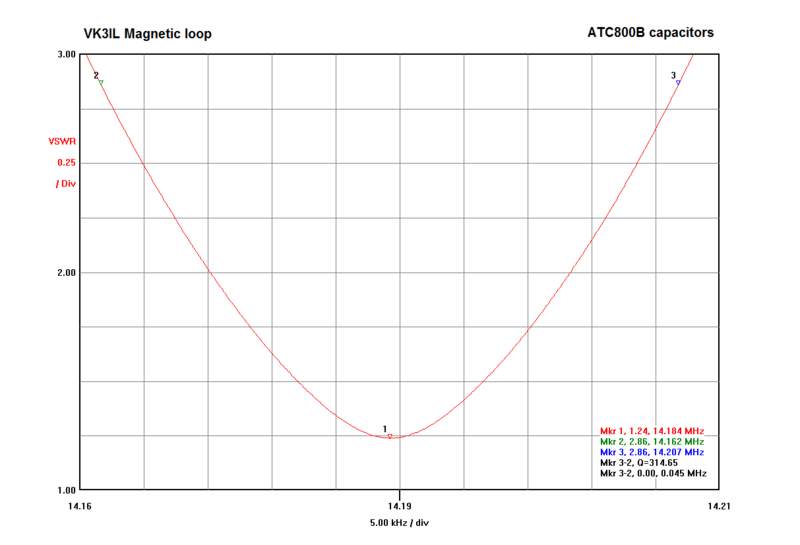 Small Transmitting Loops (STL) usually require a capacitor to tune the loop to resonance for ease of efficient matching. For an efficient STL that can handle moderate power, the capacitor must withstand extreme voltage, and must have extremely low equivalent series resistance (ESR). (Straw 2007) describes the so-called ‘trombone’ capacitor which is attributed to Bill Jones, KD7S, originally in Nov 1994 QST. (Dodd 2010) describe a small transmitting loop (STL) and gave some meaningful performance measurements. It is rare to see such measurements and he is to be congratulated. 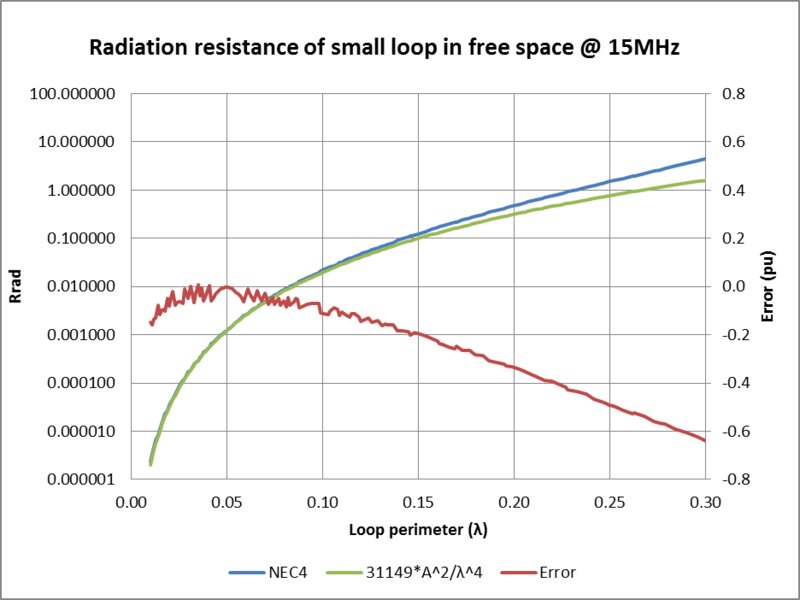 The loop is an octagon of perimeter 4.7m which at 14.2MHz is 0.224λ so although many will consider it meets the requirements of an STL, the common formula for radiation resistance Rr of a STL fail for perimeter above about 0.1λ (see Accuracy of estimation of radiation resistance of small transmitting loops). Dodd gives calculations of one of the many simple loop calculators which gives Rr as 0.422Ω, it is probably closer to 160% of that value. This is an important quantity as it has direct bearing on calculated efficiency. Dodd’s NEC model should have used a better figure for Rr, but it seems unlikely that the structural losses were fully included and its bandwidth prediction will be impaired. Above is Dodd’s measurement of antenna VSWR at 20m. This is most useful as it allows estimation of the half power bandwidth of the antenna. In this case, the antenna is not perfectly matched at its centre frequency, the residual VSWR is 1.07. The graph allows scaling off the VSWR=2 bandwidth as approximately 42kHz. 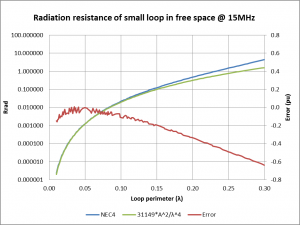 Several correspondents have asked about the application of Calculate small transmitting loop gain from bandwidth measurement to the helically loaded small transmitting loop. 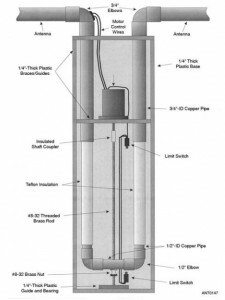 The helically loaded small transmitting loop appears to be the invention of K8NDS and is described at Stealth Antennas for the Radio Amateur and (K8NDS nd). It may not be a novel idea as it was analysed at (Maclean 1978). Without getting too much involved in the inventor’s specious arguments which attribute magic properties to his antenna, this article focusses on whether / why the calculator will or will not provide valid results for the antenna. 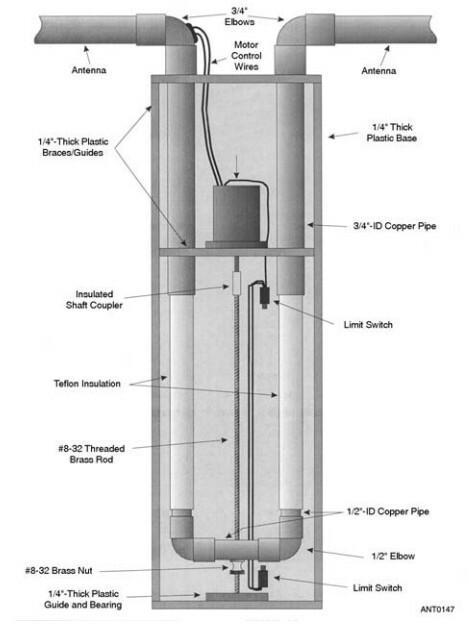 A solid copper tube “Magnetic Loop” exhibits a certain inductance per foot of the total circumference of the antenna. This article compares a series of models of a small transmitting loop at varying height above real ground using NEC-4 and NEC-2. The models are of an octagonal loop of thin wire of the same area as a 1m diameter circle over real ground (0.007/17). Height is measured to the centre of the loop, and all impedances are wrt the main loop. Above is the NEC-2 result. 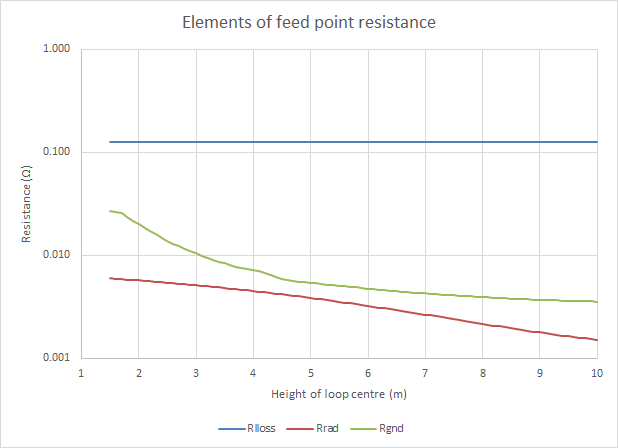 A simple formula exists for calculation of radiation resistance of a small transmitting loop in free space. The derivation is in most good antenna text books. The expression depends on an assumption that current around the loop is uniform, so the question is what is the acceptable limit for loop size. NEC might provide some guidance. A series of NEC-4 models of a octagonal loop of thin lossless wire in free space was constructed with varying perimeter. Perimeter shown is that of a circle of the same area. Many authors set the criteria for a small loop to perimeter<0.3λ, but it is clear that current is not sufficiently uniform for perimeter>0.1λ for estimation of Rr as 31149*(A/λ^2)^2 to 0.1pu error or better. 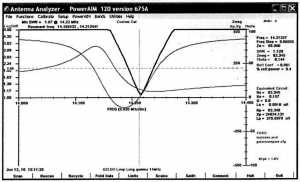 This article documents a series of NEC-2 models at 7.2MHz of a lossless small transmitting loop near ground for the insight that they might provide about underlying loss mechanisms. height varies from 1.5-10m to centre of loop. 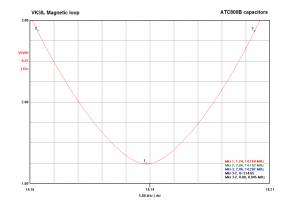 David, VK3IL, describes a small transmitting loop (STL) at Portable magnetic loop antenna. At VK3IL’s 3m circumference LDF4-50B loop on 40m. I reviewed his loop behaviour on 40m, and its efficiency was quite low… though typical of a loop of that size at that frequency. Radiation resistance of a STL is proportional to the fourth power of frequency, and since it is often dwarfed by loss resistance, we should expect that doubling frequency will dramatically improve performance. As far as I can glean from the article, it is made from a 3m length of LDF4-50B Heliax, and uses a Patterson match to tune it.